The Trusted Clean 'Dura 20' is a 20" battery powered automatic floor scrubber that offers great value at a low price point. This machine is equipped with a 3-button control panel, allowing users to learn how to operate the machine quickly. This makes it extremely user to step up to the machine and immediately start scrubbing with it. The pad assisted drive helps pull the unit along while the machine scrubs your floors to reduce user fatigue and increase efficiency. This pad assisted drive reduces the need for a traction drive, which also helps keep the cost of ownership and maintenance costs down. The Dura 20 uses a 10.5 gallon solution tank and a 20" scrub deck to clean up to 15,748 ft² per hour. This scrubber comes with 105Ah maintenance free AGM batteries, onboard charger & a 20" pad driver that allows you to attach any of our 20" scrubbing, stripping, or polishing pads. We also have offer separate brush which can tackle uneven floors better than what pads can. To top things off, this unit comes with a great warranty (5 years on parts & 2 years on labor) just to add to the great value to help anybody looking to start cleaning large areas with a scrubber. 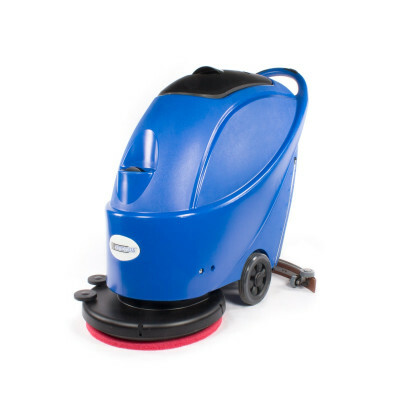 Please feel free to take a look at our full line of walk behind auto scrubbers, which includes the little brother to this machine (the Dura 17C) if you are looking for a different size or something with different options. If you're not sure what type of auto scrubber you need, give one of our cleaning experts a call at 888-722-5508 and they'll help you find the right scrubber for your needs. 3 switches located on the control panel that allows for simple operations and quick training. Rounded squeegee assembly picks up 100% of the dirty solution produced from scrubbing. Maintenance-free batteries, onboard charger & pad driver come with the machine. Built to handle heavy daily use in commercial applications like offices, schools & medical facilities. High productivity rate (15,748 ft²/hr. ), which is rated as 5 times faster than traditional mop & bucket cleaning. Comes with a great 8 year warranty on the tanks, 5 years on parts, 2 years on labor & 180 days for travel. Customers who were interested in the Trusted Clean 'Dura 20' Automatic Floor Scrubber w/ Pad Driver were also interested in the following items. This is a review for the Trusted Clean 'Dura 20' Automatic Floor Scrubber w/ Pad Driver.